Ty - Oh U Want More? The one man army meets the one man powerhouse as Big Dada delivers a unique clash of South London hip hop titans. 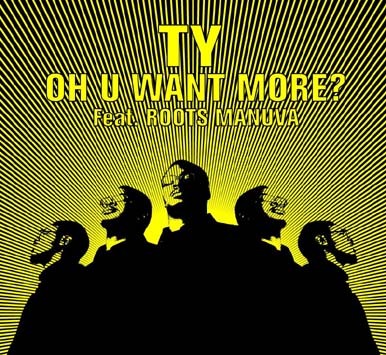 The one and only Roots Manuva returns to vinyl as a very special guest on Ty's "So U Want Morre?" – a bruising re-work of one of the standout tracks from his critically acclaimed and downright classic album, "Upwards". Ty and Roots Manuva, two of the most respected names in Our-Side hip hop, have only met on record once before, as part of Big Dada Sound back in 2000 with "Showtime". Here they trade lines, metaphors and images like they were made to work together, an infectious, funny mash up of styles and ideas delivered with the kind of carefree elan that, for some reason, people only expect from the Yank Bank. Originally envisaged as a revocal of the infectious, bass-heavy circus organ beat that had Big Ted declaring Ty "the Amazing Rapping Awkward Boy! ", Ty and his co-producer Drew were so pleased with how the vocal came out that they hooked up their own remix to round out the package. The Refix is presented here in all its glory – Bollywood vox and the kind of gritty sub-bass that make this a truly UK (and somewhat grimey) take on the Timbaland blueprint. Set to be massive in the clubs, this is what the supposed sound of "UK Urban" should be all about. Believe!